This has been a very busy week for my kitchen. I have canned, baked, cooked and prepped just about every fruit and veggie that can be grown in our region. It has been a good year for gardens and my counter was literally overflowing with squash at the end of last week. It was a tad bit overwhelming, but I dove in and canned 15 pounds of squash and pickles and baked chocolate zucchini muffins. However, even after all this work I was still left with a number of zucchini. Never one to let food go to waste, I decided to make a loaf of zucchini bread, a family favorite. After searching through recipes online I came across a recipe for Chocolate Zucchini Bread from Allrecipes.com which looked delicious and easy to make. This recipe has 13 ingredients. It takes an hour and 15 minutes to prep and cook and makes 20 servings. I made a number of modifications to this recipe. I am not a fan of using a cup of oil in baking, so I substituted the oil with unsweetened apple sauce. Growing up my mother was diabetic so I became used to substituting unsweetened applesauce in recipes from an early age. It is a great substitute for sugar and oil and keeps baked goods very moist. I left out the walnuts, I am not a walnut fan and my boys won't eat any baked goods with walnuts or pecans. Finally, instead of using two loaf pans I baked the bread in a bundt pan. I love using a bundt pan in sweet bread recipes, it makes a great shape and is easy to slice into servings. I followed the remainder of the recipe as written. I was very pleased with how pretty this bread came out. I topped the servings with frozen berries and sprinkled the top with powdered sugar. Substituting the oil made for a moist bread that wasn't overly heavy. I used bittersweet chocolate for the chocolate chips, which was nice since it didn't make the bread overly sweet. This recipe is a great way to use zucchini and will be a recipe that I will use again next year when I am swimming in garden vegetables. For the recipe Chocolate Zucchini Bread. Here is a pic of the squash and pickles I was busy making. 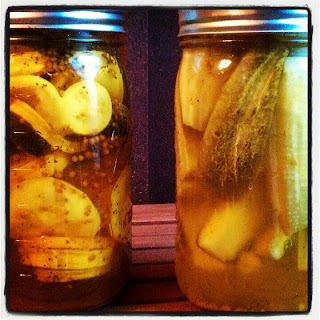 My boys love pickles and ate all 20 jars I canned last summer! Wow, that Chocolate Zucchini Bread looks yummy!! I just did a plain zucchini bread for the first time and it was delicious, so I may have to give this a try. I love plain zucchini bread, I make a ton of it in the summer! Followed you back :) Come visit again soon! That looks REALLY REALLY good. I LOVE regular zucchini bread so this is a must try! I found you through the Mom's Monday Mingle! I am a big fan of regular zucchini bread also, it's yummy :) Followed you back! Thanks :) It was yummy and it's now gone! Your recipes are fantastic! I can't wait to try this and the chocolate, zucchini muffin recipe. I will definitely be back for more. Thanks for the sweet comments :) I hope you come back and find some new recipes to try! Yum! The bread looks super delicious! Can't wait to try it! It really is yummy and delicious with fresh or frozen fruit! Thanks :) I hope you come back again and find some new recipes to try! Followed you back! I've always wanted to make zucchini bread! Hello! I'm stopping by to let you know I've nominated you for The Versatile Blogger Award. You can find more information at http://bit.ly/MimOXV. Congratulations! Love this, I have to try and make it. It really is yummy and a great recipe! That is ALOT of zucchini- but it looks like in a few weeks my garden will produce quite a bit of it too and I know my kids will love this! thanks for sharing! Stopping by from the aloha friday hop- Cheers! Yeah I have had a lot of zucchini, yellow squash, green peppers, banana peppers, cucumbers and cabbage. I'm waiting for the tomatoes, I love heirloom tomatoes, they are so yummy! 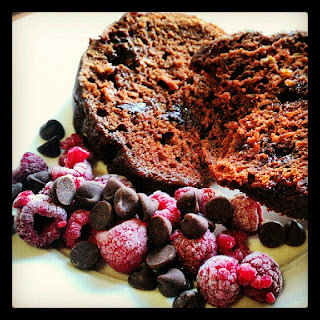 I have never tried chocolate zucchini bread, thanks for sharing! My friend gave me some zucchini from her garden, I am going to try this along with the chocolate zucchini bread and regular zucchini bread! I love zucchini bread, it is so yummy!